Young Emily and her brother with lambs on the family farm, image supplied. Emily as a child holding her toy cow, image supplied. Emily Mueller on her wedding day, Murray Bridge, South Australia, photographer: Deb Saunders Photography, Source: supplied, Emily Mueller. Emily and Trent Mueller on their wedding day, Murray Bridge, South Australia, photographer: Deb Saunders Photography, Source: supplied, Emily Mueller. I went up to Trent’s family, and I asked them if I could borrow this cow, Begonia, to participate in a handlers class… A couple of years after she kept coming to the Adelaide Show and she’s become quite a pet to us now. Trent and I both look at her as being a bit iconic, because she got us together in many ways. She’s a bit special I think. Young Trent and Emily at the Adelaide Show with Begonia, image supplied. 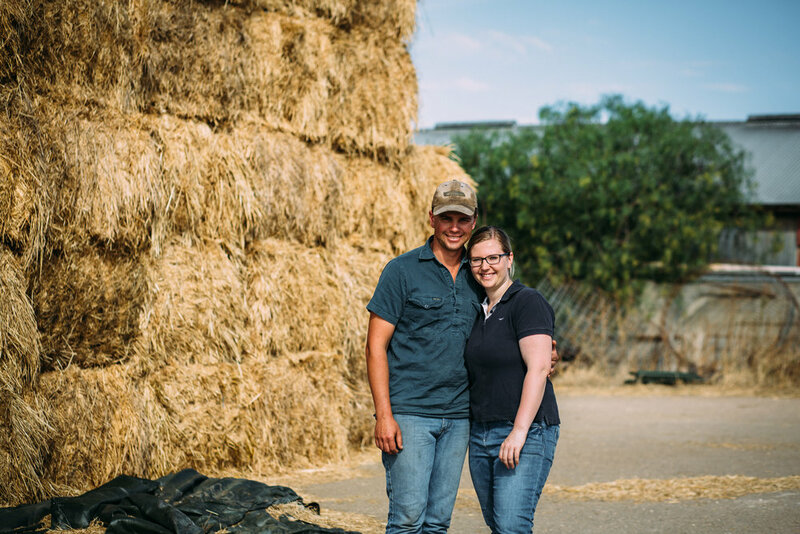 Since marrying in 2015, Emily and Trent have welcomed a daughter, Renae Alma Mueller, and the young family now live and work together – alongside Trent’s parents – on the family farm. Named ‘Glenbrook’, the enterprise produces approximately 3 million litres per year and is spread across three properties; the main dairying operations in Murray Bridge (approximately 500 acres), the cropping and pastures down the road (approximately 1000 acres) and another property in Meningie holding livestock. 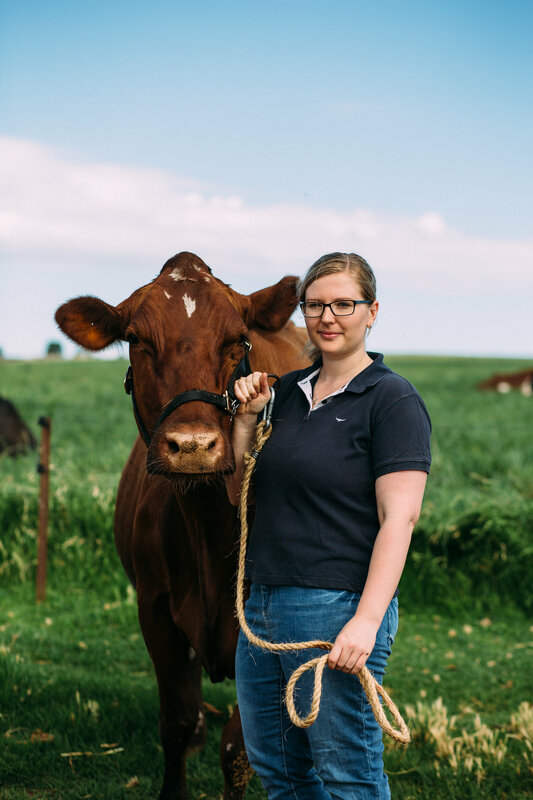 Emily currently works on the farm in a number of capacities, both indoors and outdoors, including bookkeeping, accounting, farm safety awareness, cooking, domestic duties, yard work, tending to the animals, maintenance and management of staff. Indoors, she spends more and more time helping her mother-in-law with the book-work: ‘I’m starting to help out doing some book-work, starting with doing some wages and invoices.’ Emily enjoys spreadsheets and computer work, and has been pleased to bring the skills she learnt studying her Certificate 3 in Business at TAFE to the farm business. 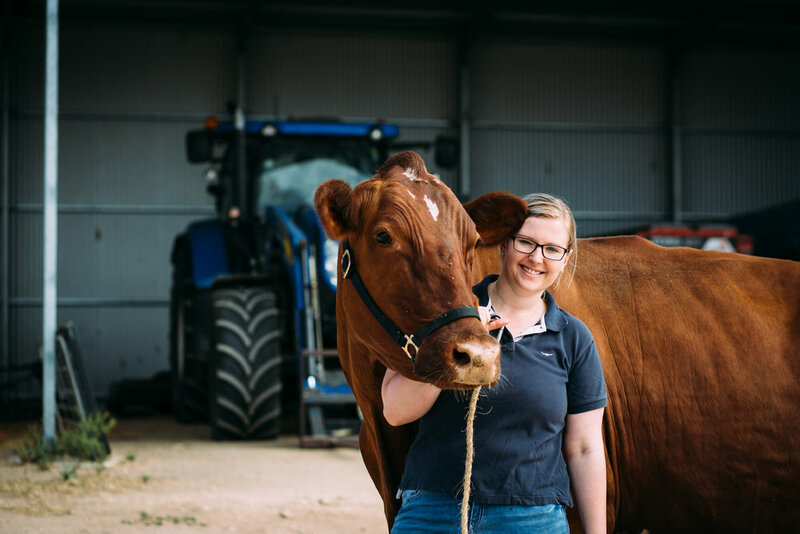 More recently, Emily has attended some women’s dairying events, including the 2017 Dairy SA Ladies Luncheon, where she has been able to mingle with other like-minded women in dairy. 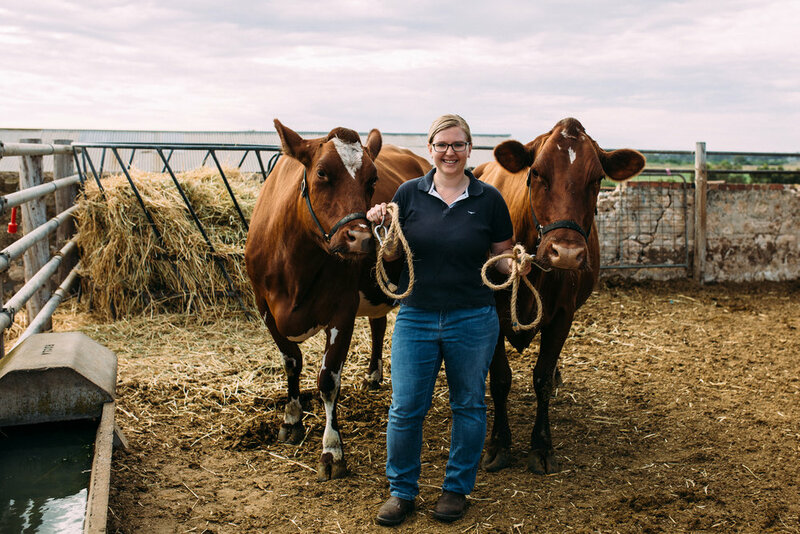 Emily believes that her connection to the local community has grown through attending courses, events and workshops, and in doing so, she feels that this community networking has helped to enhance and grow her confidence on the farm. 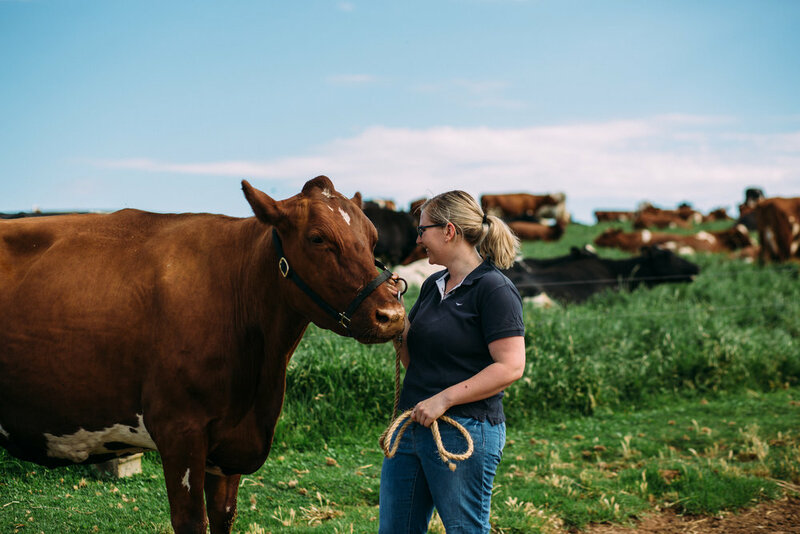 ‘I definitely feel like the networking has helped me to learn more about my role on the farm, and to grow more confident in my abilities’, she says. I think sometimes women aren’t particularly looked favourably on in the farming sectors... Women sometimes find it a bit harder to talk and to portray themselves to male bosses. Just personally, it can be a bit daunting. The males can be a little bit dominating. But it’s good that the women are standing up, and it’s an equal playing field out there now, which is good for the older generation and the males in our industry to see as well. I think males now are starting to realise that if there wasn’t females around, there wouldn’t be much happening. Without the females in their lives, it would be a whole different story. And I guess the older generation is starting to see the capabilities that women bring to the farming industries, which is really good to see. Half our workforce here on the dairy farm is now female which is just amazing, compared to how it would have been 20 plus years ago. The dairy industry tends to be male-orientated unless you’re born into it or married into it, but it’s good that two of our milkers out of four are female, and they are doing a great job. They are good to the animals, and good to the farm. In the future I want to still be farming. I guess it’s a pretty simple, straightforward answer. It’s something that I’ve always dreamt of continuing to do… I’d love to be a productive farmer and be able to have something which can give back to us in a positive way. Having good, happy, interactive workers, both male and female. Going forward, I’d just love to be able to carry on the good work that our grandparents and parents have set forward for us, and take it into the future. 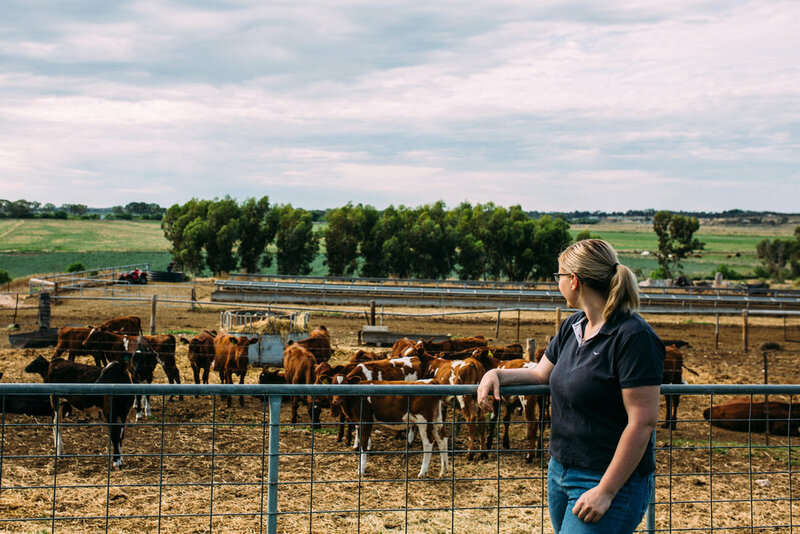 Emily looking over the farm, Murray Bridge, photographed by Catherine Forge, Source: Catherine Forge. As she ponders her future and the likelihood of one day inheriting the family farm, Emily is aware of the challenges and hardships associated with dairy farming; the long hours, the tough times, the variable and ever-changing climate and the difficulties that come with working 24/7. ‘You have your hard times’, comments Emily; ‘you’ve got climate to worry about, you’ve got milk prices to worry about, and you’ve got workers to worry about.’ With the recent dairy crisis, Emily is also increasingly aware of mental health concerns among farmers, and the fact that ‘depression in farmers can be very traumatic.’ She hopes that more can be done in the dairy industry to support farmers, and that more can be done to increase consumer awareness of the hard work that goes into producing milk. ‘I guess some people just expect that cows get milked and its simple and just happens’, she says, ‘but they might not be aware of the background work that needs to be working well to be able to produce good milk from good cows.’ Emily has recently been working on a program called the Little Foodies Program, and ‘getting little kids aware of where their food comes from.’ She hopes to get more involved with consumer awareness into the future, and help play a role in promoting the hard work of dairy farmers. Emily Mueller with her mother-in-law Julie Mueller and baby daughter Renae, Murray Bridge, photographed by Catherine Forge, Source: Catherine Forge. Yes, now that I’ve had time to think it over, I’m definitely a farmer and I’m a farmer because it makes me feel happy. That’s about as simple as I could put it. Yes, there’s always a lot of long hours that has to go into farming, but I don’t think that I could imagine not being around the farm now. I’m just passionate about it all – the animals, the land, everything! And I hope we can do our family, and the wider dairying community, proud.